Mercury Prize-nominated for his 2011 debut album, Peanut Butter Blues & Melancholy Jam, Ghostpoet — London born and bred Obaro Ejimiwe — has recently released his third album, Shedding Skin. The album features guest vocals from the likes of Lucy Rose, Nadine Shah and Maxïmo Park’s Paul Smith. You can follow him on Twitter here and visit his website here. Ghostpoet (born Obaro Ejimiwe, 18 January 1983) is a Mercury Music Prize Nominee from Coventry, UK, raised somewhere between London, Coventry, Nigeria and Dominica. A free EP entitled 'The Sound of Strangers' sidled into the public domain in June 2010. It gained him a coveted spot in The Guardian's "New Band of the Day" feature and a record contract with Gilles Peterson's Brownswood Recordings imprint. 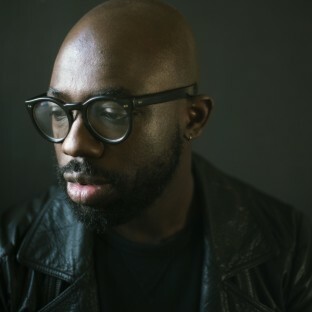 Ghostpoet dropped his debut single 'Cash and Carry Me Home' on 24th January 2011, followed by his album 'Peanut Butter Blues & Melancholy Jam' on 7th February. The 19th of July saw the debut album nominated for the Mercury Prize '2011 Albums of the Year. His single 'Survive It' was launched in Rough Trade East Record store, on May 9th 2011. A third single, 'Liiines' was promoted on September 2011 with a remix by xxxy. In February 2013, Ghostpoet premiered ‘MSI MUSMID’ on Gilles Peterson’s Saturday BBC 6Music show; a teaser track from his second album ‘Some Say I So I Say Light’. The sophomore album was co-produced with Richard Formby (Wild Beasts, Darkstar, Egyptian Hip-Hop) and released on the 6th May 2013 through Play It Again Sam. Off Peak Dreams was premiered on January the 7th, 2015. It was announced that Ghostpoet's third album, "Shedding Skin", would be released on March 2nd. The album was recorded with a traditional live set up with what has become his touring band; Joe Newman on guitar, bass player, John Calvert and John Blease on drums. The self-produced album also features guest vocals from Nadine Shah, Etta Bond, Melanie De Biasio, Lucy Rose and Maxïmo Park’s Paul Smith. http://ghostpoet.co.uk Read more on Last.fm. User-contributed text is available under the Creative Commons By-SA License; additional terms may apply.